Rather than go on about Carol and Larry -- since I think most of what needs to be said is there in the links from the previous post -- let us turn our minds to thoughts of the sea. In an abstract for the Lunar and Planetary Science Conference, which will be held in March, a team using the high resolution camera (HRSC) on Mars Express, makes the case that there was a sea the Elysium region of Mars in the very recent past -- ie the last 5 million years. The abstract was picked up by New Scientist who seem to me to have done a very good job of it. 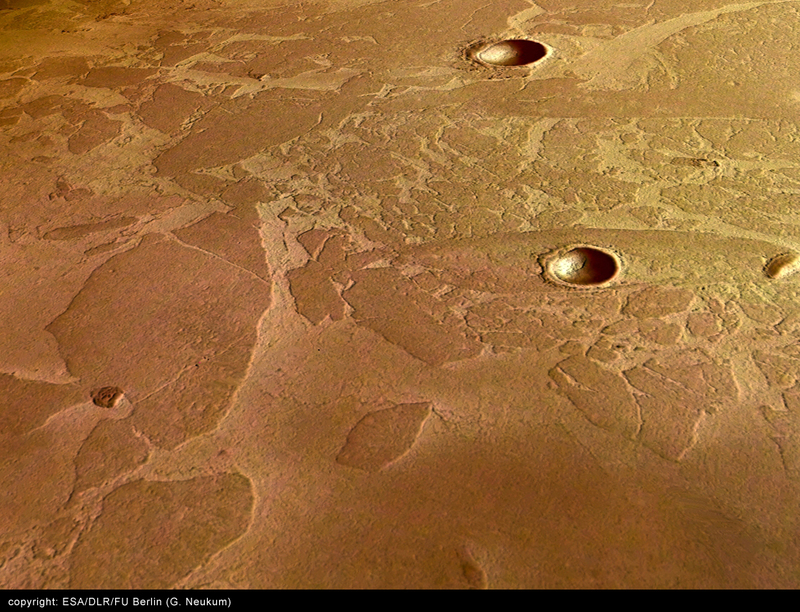 The gist of the story is this: a flood pours out of the ground in the Cerberus Fossae region and drains into a local basin, about 800km by 900km, where its surface freezes and gets covered with ash. While fresh water and volcanic heat keep getting added the system stays in flux, with plates of floating ice being formed and broken up in the flow. When the volcanism ceases, the whole thing freezes; the plates of dirty pack ice are set into a matrix of fresher ice, which unlike the pack ice is not covered with ash. The dirty pack ice is fairly stable, because of its cover of insulating ash. The cleaner ice in which the pack ice is set, though, starts to sublime -- to turn straight into water vapour. As this ice starts to sublime, its surface gets dirtier, because sediments that were in the water when it froze are left sitting there on the surface after the ice sublimes. As this "lag deposit" of sediment builds up the sublimation slows down. This seems a pretty good job of explaining what the cameras (HRSC and MOC) see. This sort of "platy" landscape has been seen and discussed before, with lava and mud flows also suggested as explanations. But to act in this watery a way, the lava would have to have incredibly low viscosity. Water really does, at least on first inspection, seem a much better option. If water is the explanation here, then it probably fits for other platy landscapes, too. If this is a fossil sea, then there are more of them. The open question is whether any of the ice remains. It might all have slowly sublimated away, leaving the lag deposits on its surface draped over what was previously the seabed. Or some of it might still be there. The case for it still being there is that craters in the area seem to be filled in by something, and that the surface is very very flat. Good arguments, but not entirely compelling. At 800km by 900km, and about 50 metres deep, the putative sea is about the size of Europe's North Sea. Crater counts on the surface put it at about 5 million years old -- with the plates a touch older than the stuff in between (I imagine there are decent sized error bars on that). That's a really respectable body of water to have gush out of the subsurface -- and if there's life in that subsurface, all that water should have carried some of that life up with it. The silty lag deposits on the surface should have little microbial corpses in them -- even if there's no ice left under them; they'd effectively be seabed sediments laid out on the surface. How well the corpses are preserved is of course an open question. Needless to say, the response to this paper will be fascinating to watch. If the morphological arguments carry the day and it is accepted as evidence for a real sea, then Mars has a new "most interesting place". After all this excitement, a note on propriety. When New Scientist reported this story, it did so on the basis of the abstract, freely available at the LPSC site, which it followed up with insights from a scientist who was not on the team (the lead author, btw, is John Murray at the Open University). After the New Scientist story hit the web, the abstract had a big red headline added to it to the effect that the material within was under embargo by Nature until mid-March. The inference I draw from this (I've not talked to the principals) is that the work has been accepted by Nature, and Nature sees the abstract as a form of prior publication, which it doesn't want. I can see their point -- but in this case trying to embargo something freely available for all the wired world to see, and which has been reported on entirely legitimately by a good magazine, just seems silly. And refusing to publish the paper now would look pretty silly, too. I'm sure the editors at Nature wish the researchers hadn't published the abstract -- but the paper wouldn't have been accepted by LPSC, where it needs to be presented and discussed, without an abstract. Anyway, this is the way things have turned out, and it seemed to me it would be rather silly not to comment, seeing as the story’s out there anyway. "Nature's" obsessive (or Scrooge-like) guarding of their proprietary rights has annoyed a lot of people for some time. Including me. According to the credits on the HRSC web page, the pack-ice sea is revealed in the image taken on orbit 32 of the mission. With a 6-7 hr orbit Mars Express is now on about orbit 1400 and there must be several hundred HRSC images in total. Given that this amazing discovery has been made almost a year after the image was taken (and one that was presumably less than perfect during calibration/commissioning of the camera) it seems there might still be alot to be revealed by the stereo/colour camera on Mars Express over the coming years. Having waited a year for the MARSIS radar to deploy there is a certain irony that the first evidence for an equatorial sea was found using the camera. It is also reported that at just 45m deep the radar would probably not have detected such a shallow body of water/ice anyway! ESA has released a much better Mars Express image to coincide with the Mars Express Science Conference at Noordwijk earlier in the week. New Scientist have also posted a follow up to last weeks article also covering John Murray's presentation and the subsequent discussions at Noordwijk - they note that Vittorio Formisano pointed out that Elysium is the area where he found the most evidence of Methane. In the image (see link above) of the "pack ice" there's a crater smack dab into the center of a largish chunk of ice. I wonder if its a nice sploshy frozen ejecta blanket could serve as a useful analog in finding other mantled ice on Mars. ?? There certainly seem to be alot of craters like it. A correction: the embargo strapline was added before the New Scientist story hit the web, but after they had first seen the abstract. So it wasn't under embargo when the news was gathered, but Nature tried to make it so subsequently. I'm really glad to see you are writing about Mars again. My comment isn't specifically about ESA results and Nature, though. Two years ago when I decided to return to grad school to study martian geology, I decided to do some reading to get myself up to speed. By happy accident, I started with Mapping Mars. While I was reading this book I was also auditing a seminar course where we read planetary geology articles. Three of the professors who attend have been involved in NASA missions in the past (and one is even mentioned -- very briefly -- in your book.) When the decision came from NASA about where to land the two rovers, a good bit of seminar time was devoted to a debate about the best sites. Well, a day or two earlier, I had been reading in your book about how sites are picked. And I had the eeriest sense of deja vu, as the professionals in the room essentially duplicated the discussion you had reported in the book. Only the details of the missions were different. In short, I think you really got the flavor of the scientific debate and described it perfectly. Also, last year, when I went to my first LPSC, it was quite a thrill to see people walking around who I had read about and felt like I had gotten to know by reading Mapping Mars.